It's really hard to grasp that one month ago we were in Wales. A lot has happened since then and our trip seems a little distant already. There are many sites I've not yet shared here, and it's a great memory-jogger when I do. So let's visit Llanerchaeron - my cousin told me that the pronunciation of the "Ll" is like saying an "L" with the tongue towards the front palate and letting air pass on both sides of the mouth. Try it - I think it's a little bit like a "CL" sound. Correct me if I'm wrong. While going through my photos, I realized that I did not take a photo of the outside of this Georgian villa, designed by John Nash in 1795. Nash later went on to design Buckingham Palace, Regent Street, and Brighton Pavilion. So I took the above photo from the Llanerchaeron site. Nash was all about symmetry. The dining room is to the left of the front door in the top photo. The sideboard at the back of this photo is the front of the house. You'll notice there's no window on that wall in the dining room. But there is one outside. It's fake, just there for symmetry. 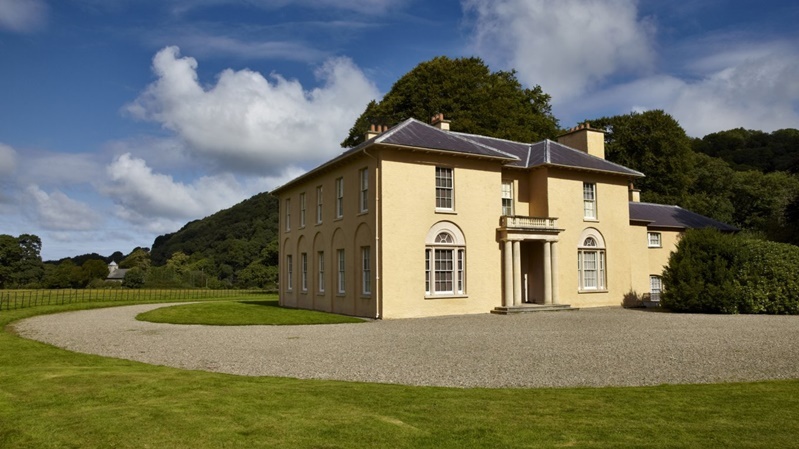 Llanerchaeron is a small estate, as estates go. Ten generations of the Lewis/Lewes family. It's been well preserved and displays the self-sufficiency of an estate more than any other site we've seen. 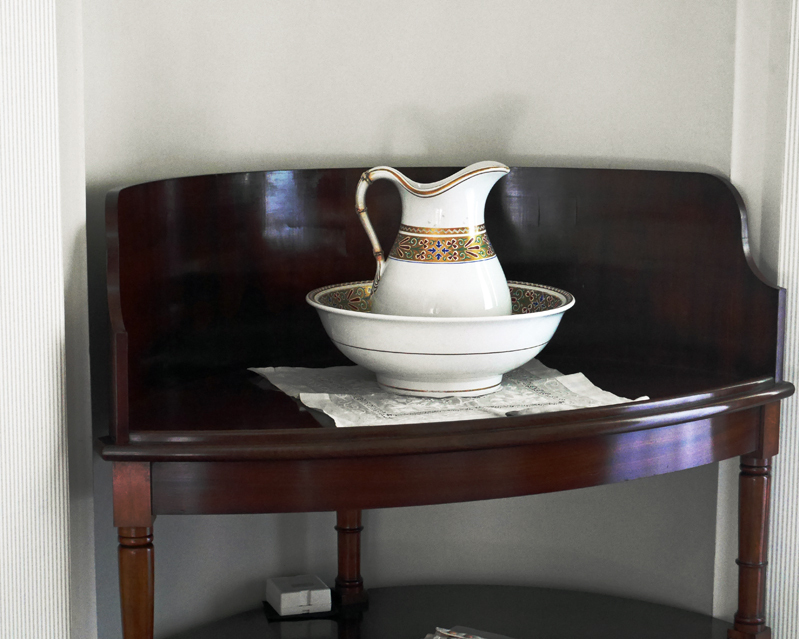 The wash-basin stand in the photo above looks as though it was created especially for the curve of the wall. 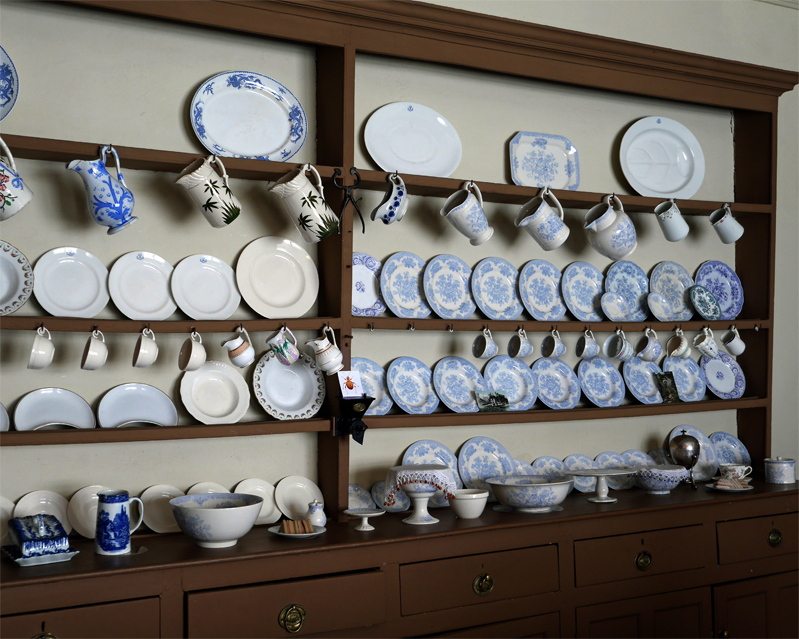 In the enormous kitchen, this dresser of china caught my eye with the blue and white. Teresa, my cousin, told me that this is Burleigh Ware, made in England from Devon and Cornwall clay. I went onto the Burleigh site after arriving home and am now thinking that Burleigh Ware may be in my future. There's a great article on the site that tells how to achieve the "Dresser Look". A focal point of any kitchen is the stove - this one is massive. I can't imagine the heat it would generate on a hot day like the one when we visited. The house where the family lived is not particularly large and the supports needed for such an estate are much more expansive. We saw the stables, the coach house, the cow barn and pig sties, complete with animals. After touring the living quarters and kitchen, we visited the cellar where beer was stored for the staff, and wine for the family. 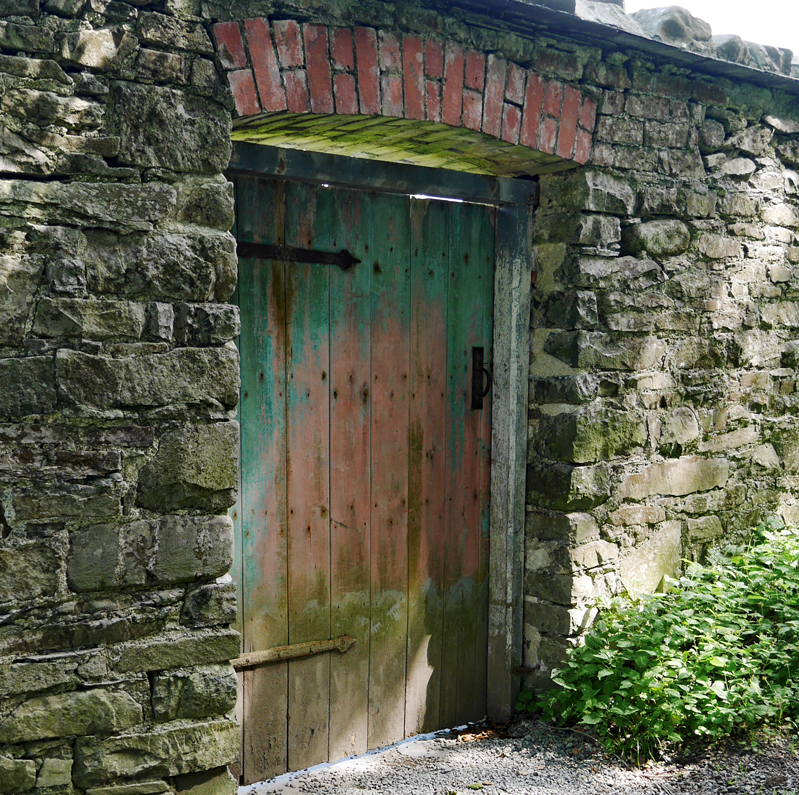 There were laundry rooms, servants sleeping quarters, a cheese room, salting room, scullery, baking kitchen and more. It really gave a picture into the "upstairs-downstairs" aspect of life for decades before the First World War. Such an estate provided work and sustenance for a large community of people. The walled garden was especially interesting. Within the micro-climate created by the high stone walls, food and flowers were grown to last the year. 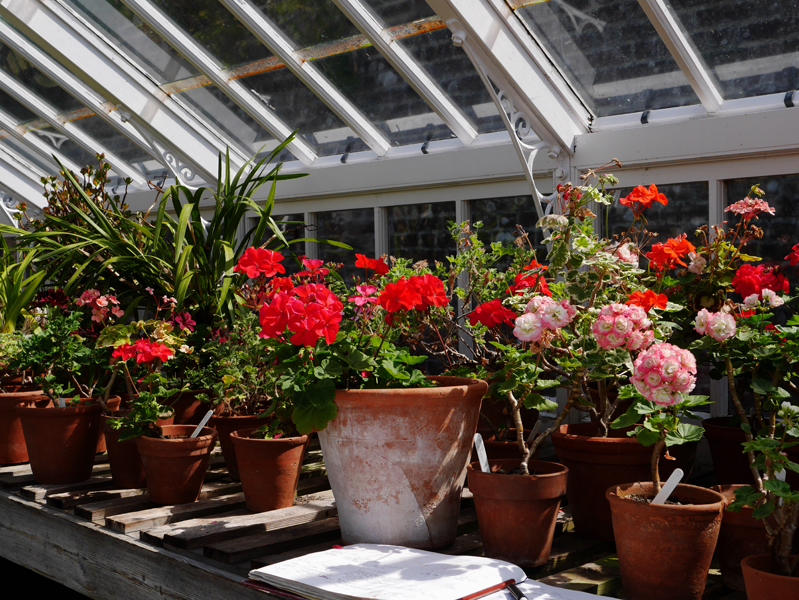 Several years ago we watched the BBC production The Victorian Garden that documented each month of the garden. It was so interesting to see such a garden, once neglected, now being brought back to life. Isn't the door pretty - all those coats of paint add so much character. Signs asked visitors to be careful about closing the doors to the garden as the farmyard animals were not welcome there. The glass house held geraniums and other tender plants, including tomatoes. Roses adorn various outbuildings and small offices. 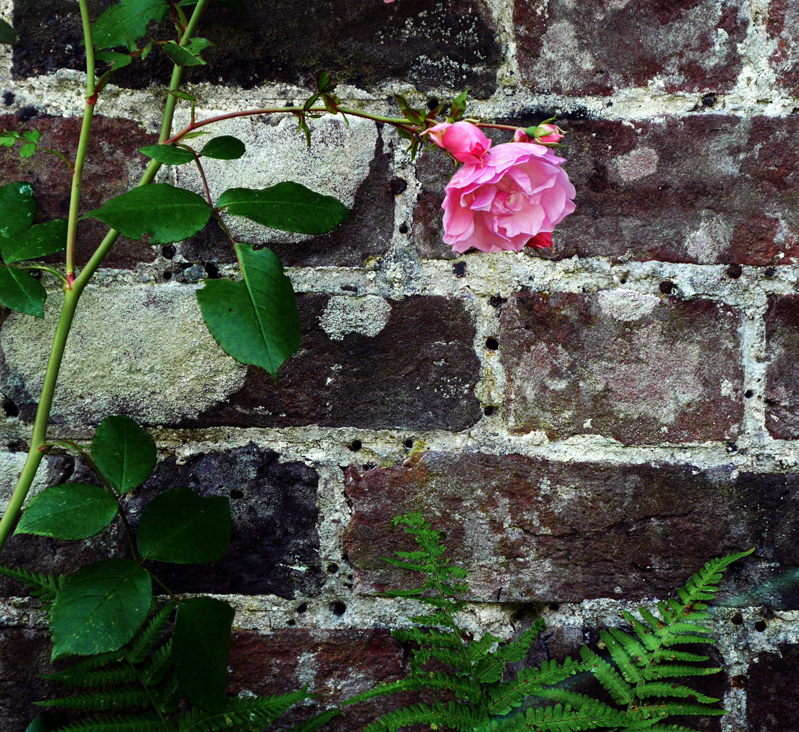 Roses and brick or stone walls make a wonderful pair. Llanerchaeron gave such a complete picture of life on a small estate. We thoroughly enjoyed ourselves. Your photos show the eye of an artist. I love that old garden gate. 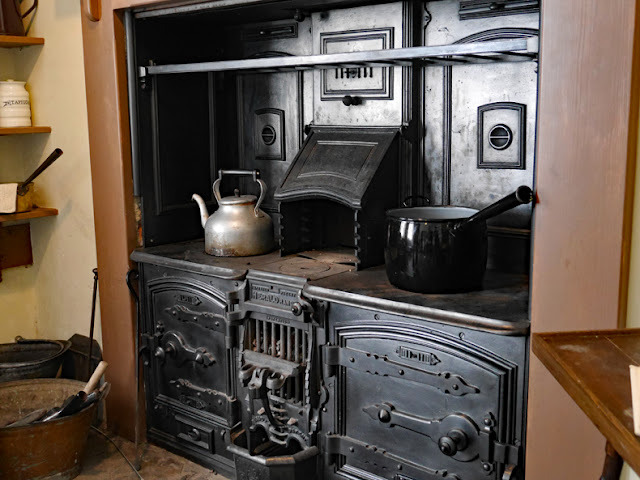 I always enjoy seeing the kitchens and servant quarters when I tour old houses. I find it so interesting…probably because it is much of the "workings" of the house. Isn't it odd how much difference a little time can make? I hope that by doing these features for your readers the time away will seem nearer because such a journey requires remembering and sharing. Thank goodness for the stay-at-home crowd like me! Such great photos - I really get the sense of being right there - and the history is so interesting. This is lovely! Thank you for sharing these visits with us. I enjoyed that little tour, Lorrie. This is such a pretty estate. I'd like to have poked around a little more, so I hope that you have some additional posts planned! Oh, what a lovely visit. Thank you for taking us along. Your shots are perfection! It's so nice to tour these wonderful places with you, is the estate now owned by the NT? I have four pretty blue and white Burleigh coffee mugs which I love so can understand why you've become a fan after seeing that wonderfully laden Welsh dresser. Beautiful photos and I love your colorful mosaic. Enjoy your week Lorrie! Somehow a small estate brings the reality of life home much more so than a very large mansion/palace. You can almost imagine living there. Isn't the dresser beautiful! You certainly took us on a wonderful stroll around the estate, what a great place to visit. Loved the stove. Hello, I think I would have trouble pronouncing this name. It is a gorgeous place, I love the huge stove, garden gate and roses are beautiful. Awesome tour and photos. Happy Monday, enjoy your new week! I love, Love, LOVE the Welsh Dresser you showed!!!! Wish I'd gotten one of those instead of my Bakers rack in the kitchen. Stunning photographs. My favorite is the old garden gate. Beautiful. TFS. Have a great week. What a wonderful spot! I really enjoyed your images of Llanerchaeron. Love the blue and white and fun to see the animals. Have a great week! I love that there was a fake window placed simply for symmetry. It sounds like a fine idea to me! What a fascinating, beautiful place to visit. How I would love visiting here. The structured garden would particularly entice me. Love the story of no window on the dining room except for a fake one on the outside. Thanks! Lovely estate and a pretty mosaic. I'm glad you will be sharing more from your trip in the future, too. such a blessing for you to have been able to go. Lovely photos, Lorrie. I'm also admiring the blue and white china and have added Burleigh Ware to my wish list! Ooh Lorrie, I'm so admiring that dresser of china! I really think you should be a professional photographer, as you have such an eye and talent for it. The last photo of the rose against the wall...I'm sighing! It's so good to know that your dear MIL is doing so well. That must have been a magical time just walking through the grounds and home. That door makes me want to experiment but I know it couldn't be duplicated, only time brings that effect. The Dresser Look is timeless, isn't it? A true Welsh cupboard look. I will forever be enamored of a look into the upstairs/downstairs life. I'm sure you left part of your heart in the regions you visited, I would have! 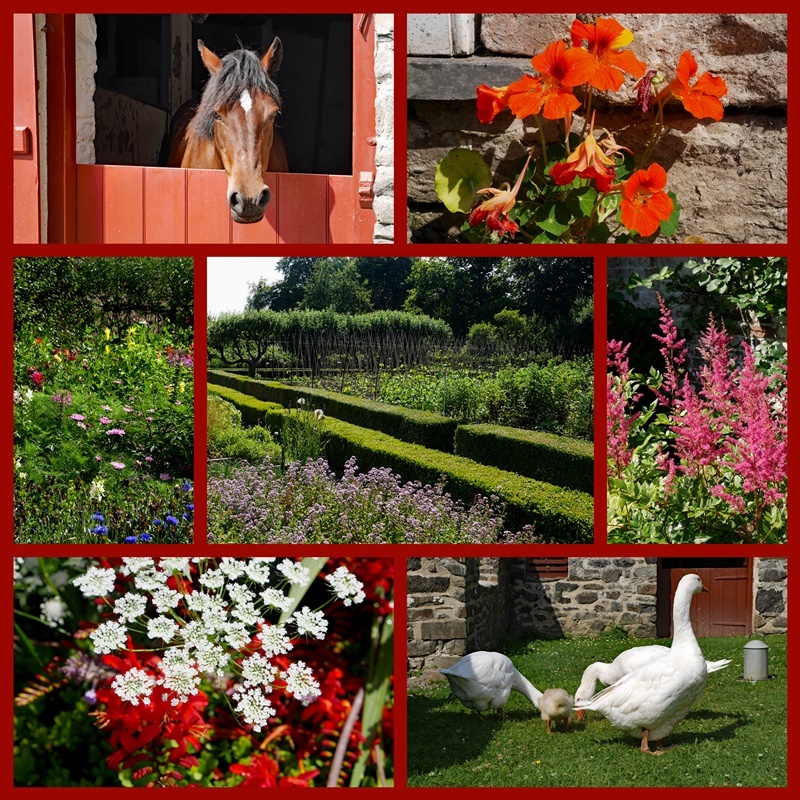 Gorgeous photos, Lorrie, and with each one, I escaped deeper and deeper into the romance, charm and mystery of your Welsh visit. How magnificent that you got a chance to travel to such a beautiful and dreamy land; pure storybook! Beautiful place, not far from me, so yes, I'm Welsh. Of course there is a proper way to pronounce the Welsh doube-l. LL is regarded and taught as one stage in the alphabet, not as two letters put together. It does not, to Welsh ears, sound at all like CL!!! Try putting the tip of your tongue behind your top front teeth and widen your mouth sideways a little. Then blow from the sides of your mouth. I know it sounds odd, but it is the only way to make that distinctive LL sound. It's not the worst of place names by any means - try Llanfairpwllgwyngyllgogerychwyrndrobwllllantysiliogogogoch, or Llanfair PG for short! Lorrie, A lovely estate. I think it funny not to actually allow the light into the dining room. The flowers a wonderful. I love the door. The Secret Garden is one movie I have watched many times. Thanks for sharing. Sylvia D.
Whales is on my bucket list, so your photos encourage me start planning. The old English estates are such a tribute to history and a good lesson on how easy we have it today with modern appliances. I can't image working as a servant in such a kitchen. 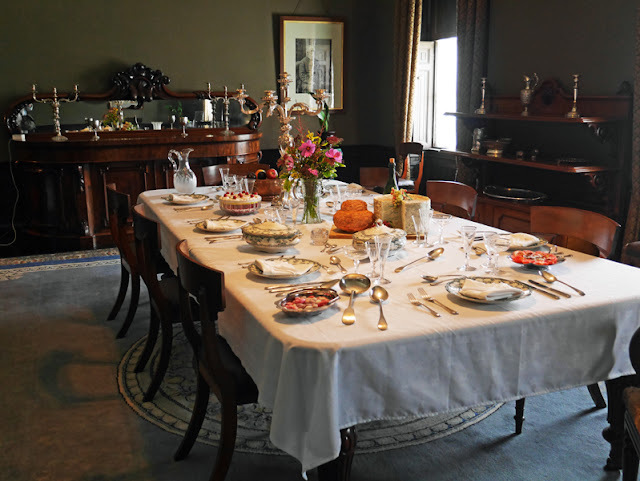 All the work that they had to do to prepare a meal fit for the master of the manor. Loved your photos and your narratives. How's those plums and beans turn out? 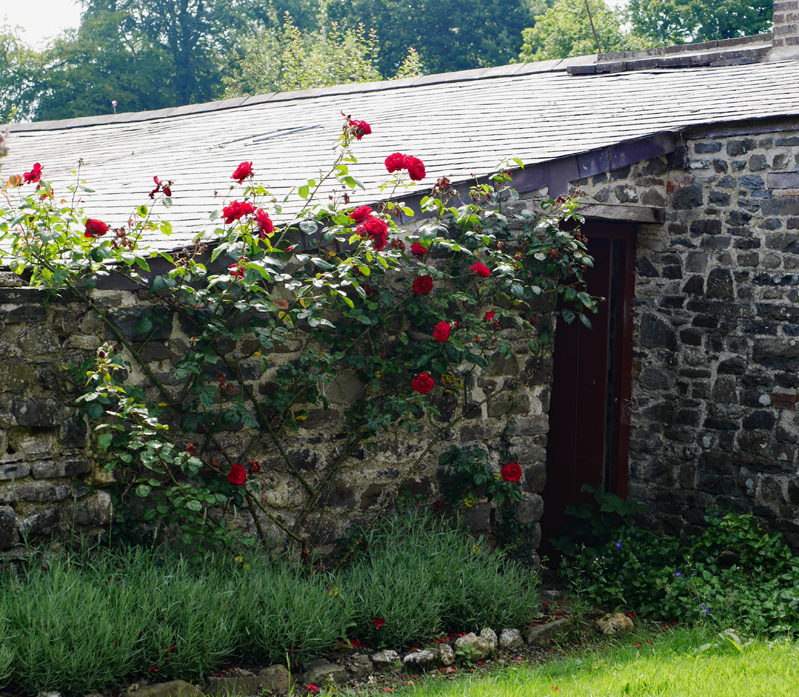 Loved seeing this estate - I still need to spend time in the beautiful Welsh countryside.